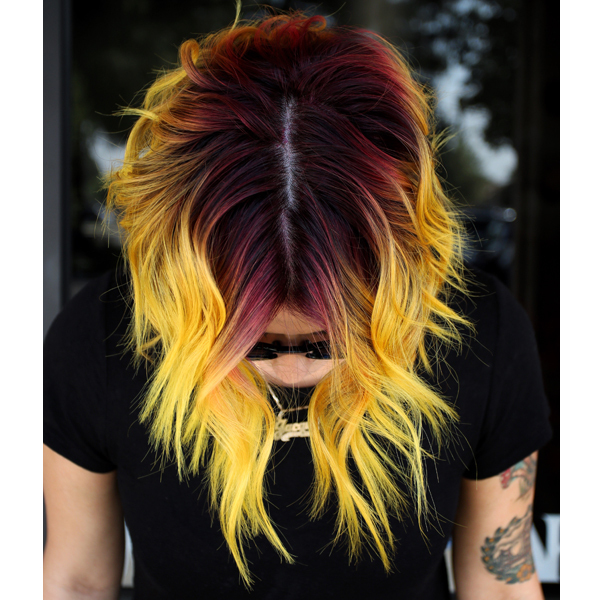 Colorists are taking lit to a whole new meaning with the season’s hottest trend—haircolor that’s literally on fire. That’s right. We’re seeing neon yellows, orange flames and statement-making reds everywhere we look, so catch up on this fashion color favorite with these eight formulas! Yellow is majorly on-trend right now, and this unconventional color comes with lots of variations. One fun take? This sunflower color melt from 2017 #ONESHOT winner for Vibrant Color Shot of the Year Frances Garcia (@makeupbyfrances). If you have a client who is dying to join the Peach family, but can't figure out the perfect shade, we have a feeling this dimensional one (which got more than 9,000 likes on our Insta!) could be a winner.